Smoked Salmon and Egg Salad - Great for any meal! Home / Blog / Smoked Salmon and Egg Salad – Great for any meal! Assemble the lettuce and spinach on a plate. Add the cheese, avocado slices, and olives. 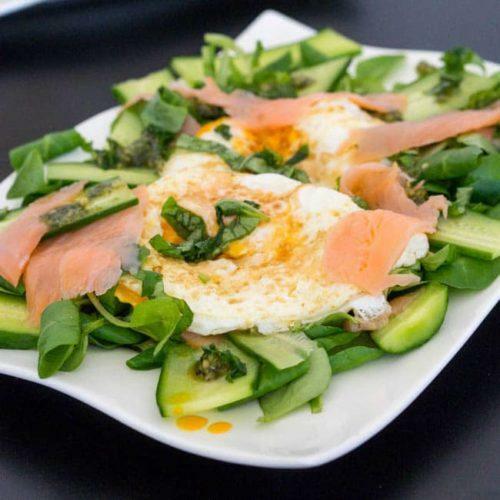 Layer the salmon on top of the greens and top with the egg. Drizzle with olive oil and a tbsp or so of lemon juice. Salt and pepper to taste. This salad is so, so good! I made mine without the salmon, because I am not a fan of smoked salmon, and it was delicious. My husband made it again the next day for lunch, because he just had to have it again.